The Conscience of the King has no requirements to overcome. It does not stop, kill, capture or take command of personnel. It does not return personnel to hand. It does not let you or your opponent score points. All it does is make other dilemmas cheaper to play. 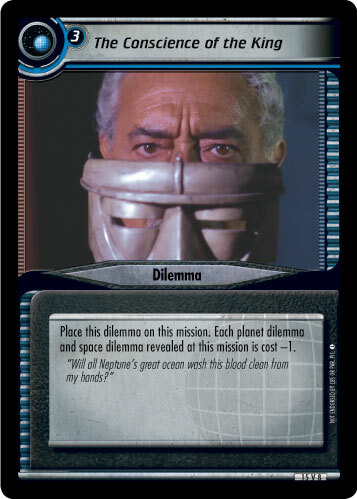 In particular, once it has been placed on a mission, it reduces the cost of each planet dilemma and each space dilemma subsequently revealed at that mission by one. Should you want to take full advantage of this card, you are going to want to build your whole dilemma pile around it. The key dilemmas are going to be Command Decisions, Kolaran Raiders, Magnetic Field Disruptions, Triage, Cultural Differences, Warp Bubble Mishap, Neurogenic Field and Night Terrors. All are one-cost planet or space dilemmas that either stop or kill a personnel. Providing you can play The Conscience of the King during your opponent's first attempt at any mission, each of these other dilemmas can be played for free. Then all you have to worry about is drawing dilemmas, and you should be able to stop your opponent over multiple mission attempts. The first issue will be getting The Conscience of the King placed on your opponent's mission. Not Easily Avoided solves that problem. By discarding two cards (or an equipment card) from hand, you can search your dilemma pile for any one dilemma and, after shuffling, place it on the top. Fortunately, Not Easily Avoided is a Q event. This means, if you can't draw into it, you can download it by attempting Collapse Anti-Time Anomaly. The second issue is drawing additional dilemmas, so that you always have something to play. Storage Compartment will be vital here. Even if your opponent gives you zero to draw, you can still take dilemmas from Storage Compartment and play them (don't forget that they'll have to play for zero cost.) Before you get to that stage though, you can use both Bigger Tattoo and Vacation from the Continuum to draw additional dilemmas. By a happy coincidence, both of them are also Q events and can be downloaded by attempting Collapse Anti-Time Anomaly. Just remember that you can only download a Q card if there are no overcome dilemmas beneath the mission, so you'll probably only get one download in a game. The third and final issue is running out of dilemmas. If each one only stops or kills one personnel, then you could easily use all of them in a game. If you were to add No-Win Situation to your deck, then you could stop up to four personnel with each dilemma. Or, you could add Tragic Turn to your dilemma pile and effectively double each stop or kill. Final thought: How about combining The Conscience of the King with Eris (Duplicitous Vorta) and Devna-Lev (Harrad-Sar's Barge), to play any planet or space Persistent dilemma at cost-3?